Infused with the flavors of lemon-oregano oil and slow-roasted cherry tomatoes, Salmon with Tomato Confit is as a delicious a dinner as it is easy. It hardly seems possible that I’ve made it through eight whole posts on this blog (and probably about twenty different dinners) without highlighting my long and enduring relationship with seafood. 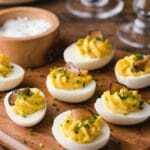 With so many different varieties, flavors, and textures to explore, it’s a food lover’s dream. 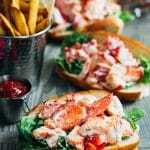 While the ninth post may be the charm, it’s safe to say that there will be no shortage of seafood recipes shared here at Striped Spatula. Get your fish forks ready! I’m fortunate to live in an area with an abundance of fresh seafood. Hardly a week goes by that I don’t pay a visit to my local fishmonger. I have my favorites, but I try to never walk into the market completely set on what I’m going to buy (and almost always end up leaving with more food than I intended). In terms of preparation, I find that good, fresh fish needs minimal treatment to be delicious, making it perfect for weeknight meals. Broiled sole with fresh-herbed breadcrumbs? Wonderful. Pan-seared swordfish steaks with compound-herb butter? Pass me a plate! This past weekend, I found myself tempted by a display of beautifully-marbled organic salmon. Although I entered the market with halibut on my mind, the salmon was too good to pass up. As luck would have it, I had purchased a basket of gorgeous cherry tomatoes from the farm market mid-week, which I planned to turn into tomato confit within a few days. Salmon and tomato confit? I had to leave the store before my tastebuds went into overdrive. When I got home, I still wasn’t exactly sure how I’d pull it all together. 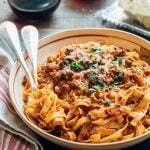 Sure, the flavors were a good match, but it was, after all, the weekend, and dinner needed something more.Thankfully, a quick search of the Gourmet Magazine archives yielded a recipe that fit the bill. 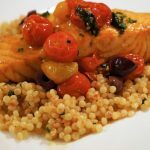 The brilliant folks at Gourmet decided to pair salmon fillets with pearled couscous (one of my favorite sides), dressed with tomato roasting oil and lemon. Yes, please! 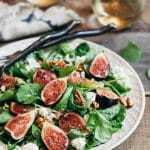 For a dinner that’s so easy to prepare, this dish is so delicious and bursting with flavor that I would absolutely serve it to guests. 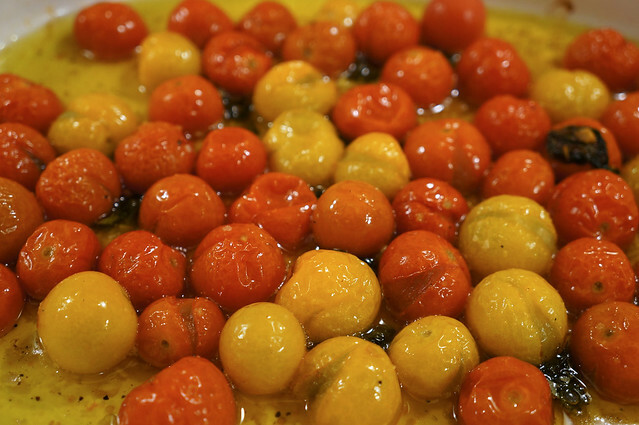 The most time consuming component is the tomato confit, which roasts in the oven for an agonizing two hours. The slow roast is worth the price of admission, though. The intensity and brightness of the tomato flavor lends a perfect balance to the buttery salmon. If, like me, you only need to make two dinner servings on a typical night, I highly recommend sticking with full recipes of the couscous, tomato confit, and lemon-oregano oil. 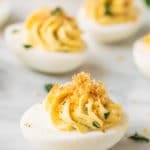 Not only were they delicious in this dish, but they also made a wonderful accompaniment to chicken breasts a few days later. 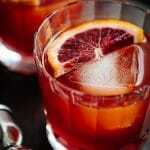 I can imagine that they would also pair well with shrimp, grilled pork, or even that halibut I’d been pondering. 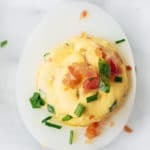 Lots of possibilities here, even if you’re not as ardently in love with seafood as I am (although, I think this recipe might be tasty enough to score some converts!). 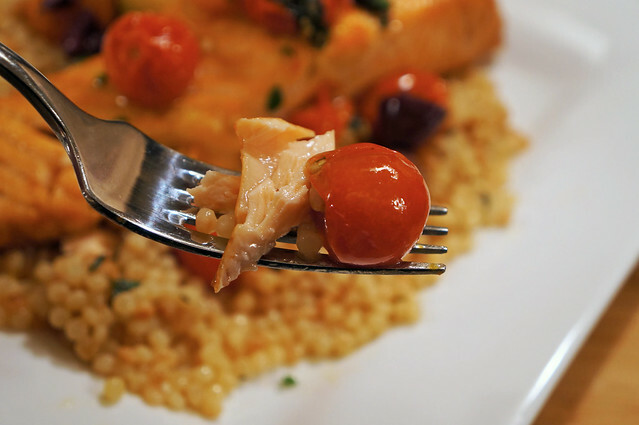 If time is of the essence, the tomato confit can be prepared a few days in advance and refrigerated in its roasting oil. Just bring it to room temperature before serving. 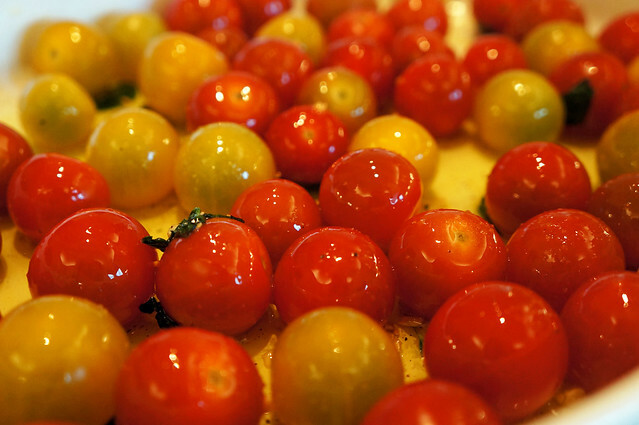 Preheat oven to 250 degrees F.
Arrange cherry tomatoes in a single layer in a shallow baking dish. Season with 1/2 teaspoon salt, 1/4 teaspoon pepper, and sugar (if using). Heat olive oil in a small skillet over medium heat until warmed. Add chopped garlic and cook, stirring occasionally, until lightly browned (1-2 minutes). 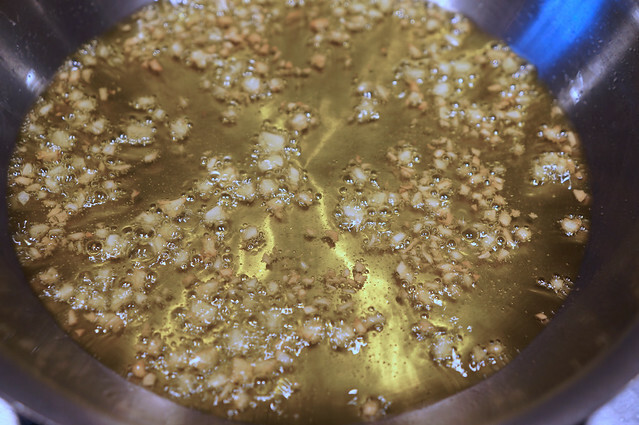 Do not overcook, or garlic will become bitter; it will continue cooking in the hot oil after your remove the pan from the heat. Remove from heat and stir in basil and oregano leaves (the herbs will immediately wilt). 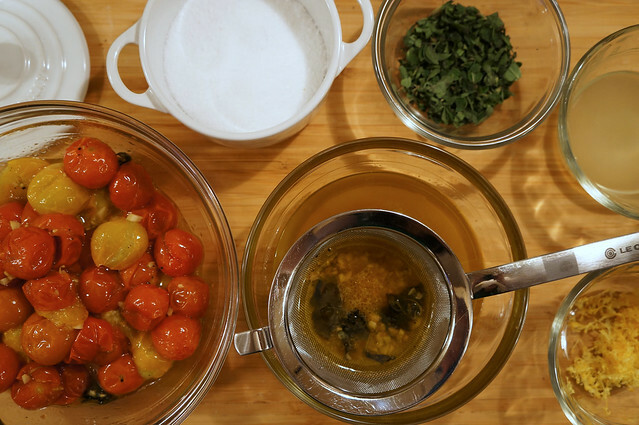 Pour the oil over the tomatoes and gently shake baking dish to coat. 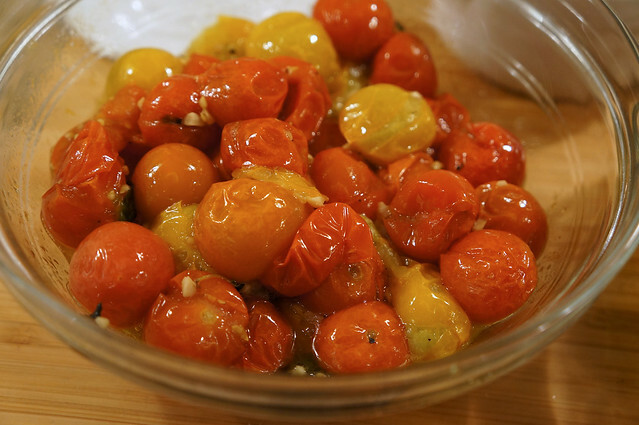 Roast until tomatoes are soft and the skins begin to split/wrinkle, about 1-1/2 to 2 hours. With a slotted spoon or spatula, transfer tomatoes to a small bowl and set aside. Using a fine mesh strainer set over another small bowl, drain oil, discarding solids. Stir in 2 tablespoons chopped oregano, lemon zest and juice, and remaining salt and pepper. Set aside. Heat olive oil in a saucepan over medium heat and toast couscous, stirring frequently, until light golden brown and fragrant, about 5 minutes. Add chicken stock, water, and salt, stirring to combine. Cover and simmer couscous until most of the liquid is absorbed, and couscous is al dente in texture, about 10 minutes. Remove from heat and let stand, covered, an additional 10 - 12 minutes. Fluff with a fork. 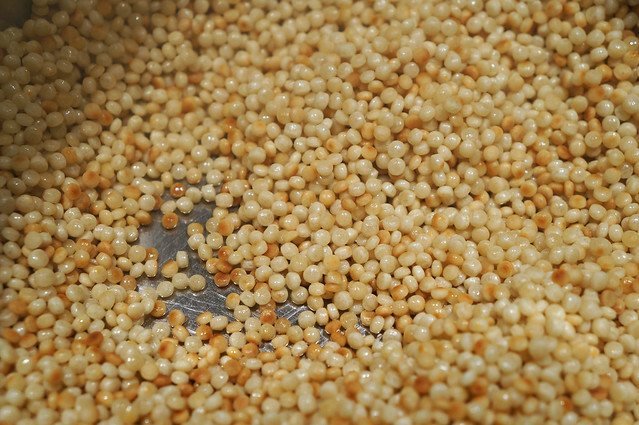 Add 3 tablespoons lemon-oregano oil to the couscous and gently stir to combine. 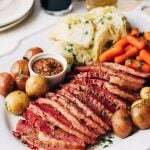 Season to taste with salt and freshly-ground pepper. Preheat oven to 425 degrees F and line a rimmed baking sheet with foil. 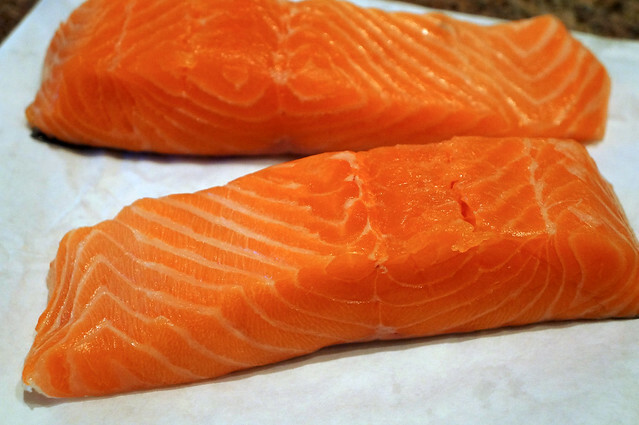 Place salmon fillets, skin side down, on baking sheet and brush with olive oil. Season with kosher salt. Divide couscous between plates. Sliding a thin metal spatula between fillet and skin, lift salmon from the baking pan and set atop couscous. 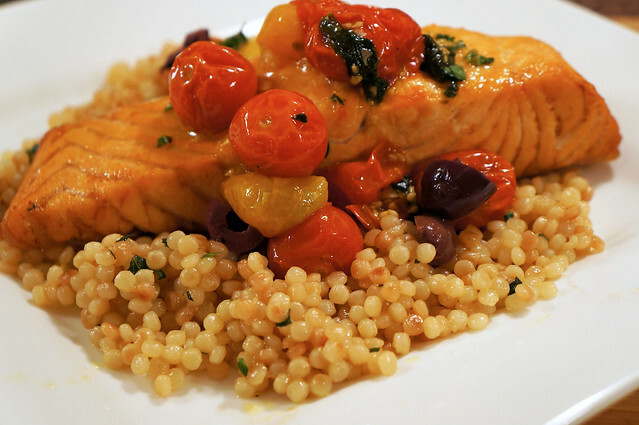 Top salmon with a spoonful of tomato confit, a few Kalamata olives, and a drizzle of the reserved lemon-oregano oil. *Sugar may or may not be necessary, depending on the sweetness of your tomatoes. The cherry tomatoes I used were extra-sweet, so I omitted the sugar this time around. Remember that the slow-roast will intensify the flavor of the tomatoes, so tartness will become more prominent in the final product. **Cooking time will depend on the thickness of your salmon fillets and your personal preferences for doneness. Personally, I like my salmon cooked through, until it flakes, but is still juicy. In my oven, this takes about 15 minutes for a 6-oz fillet. You can check for doneness by inserting the tip of a knife into the thickest part of one of the fillets and taking a peek at the interior color and texture. 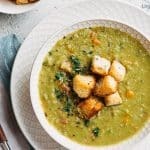 Have you made this recipe?Let me know by leaving a comment and rating the recipe below! Don’t forget to take a picture and tag @stripedspatula and #stripedspatula on Instagram for a chance to be featured in my newsletter! 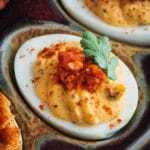 After devouring the pumpkin muffins I was looking for a low calorie, healthy recipe to make for dinner. I chose this one despite being allergic to salmon. I substituted cod for the salmon and still had a flavorful, colorful dinner, I can only imagine how good it would have been with salmon. Do not forget the olives as they really make this dish more interesting. The cod sounds delicious! I’ll have to give it a try with the confit and couscous the next time I visit the seafood market. I’m so glad you enjoyed the recipe, Leslie! Don't subscribeAllReplies to my comments Receive email notifications of follow-up comments? 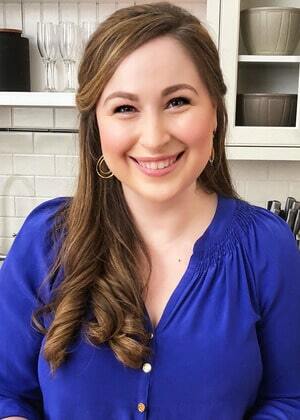 I'm Amanda, and I love to create gourmet, seasonal recipes for every day and entertaining (sometimes, with a splash of bourbon, too). I'm inspired by the beauty of fresh ingredients, the people and places I visit, and believe that there are few bad days that can’t be improved with a warm baguette and a wedge of Brie. 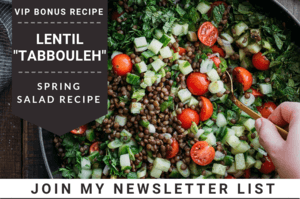 Join my newsletter list and receive my VIP eBook with bonus recipe!